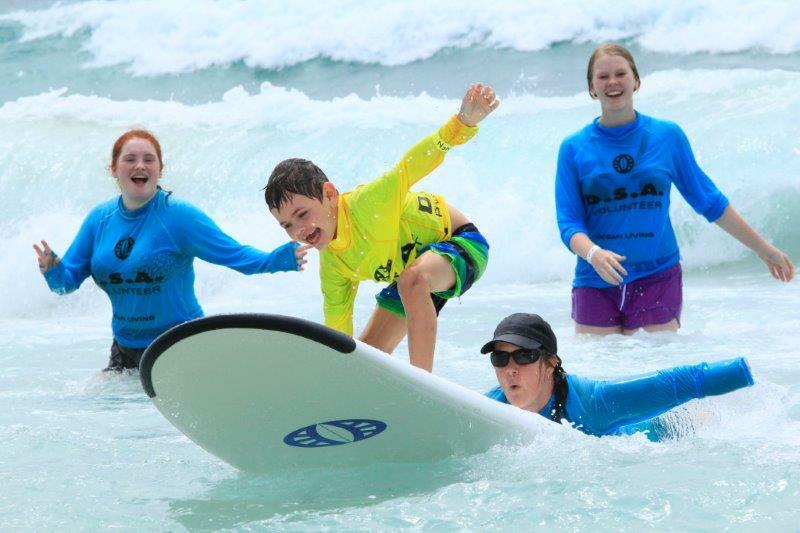 The Disabled Surfers Association of Australia (DSAA) are a volunteer-run organisation that enable people of all ages and abilities to take part in one of Australia’s most popular past-times, beach surfing! 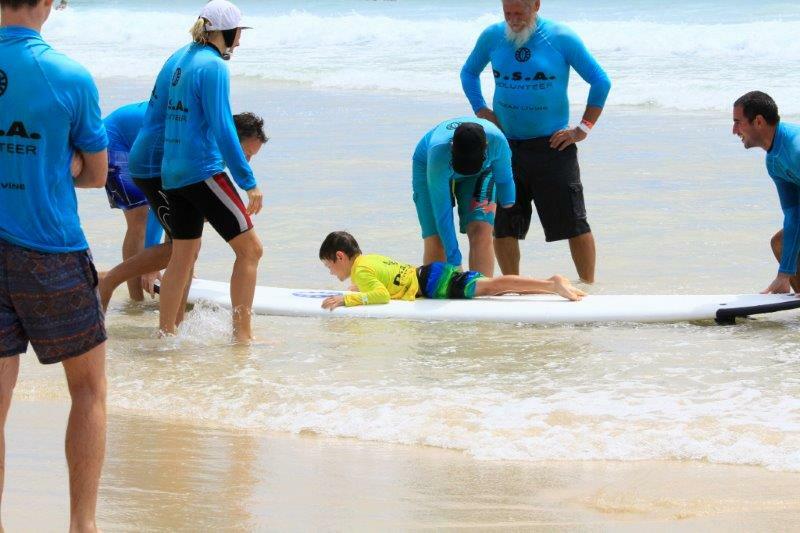 Your family might want to consider attending one of their events after reading about amputees who are engaged with the DSAA as well as the vision, commitment and safety the organisation puts in place at each of their surfing events. The Disabled Surfers Association was established in 1986 by Gary Blaschke after a traumatic accident which saw him undergo extensive rehabilitation. As a surfer himself, Gary saw that many surfers who developed a disability or condition then felt they couldn’t return to the water as they didn’t have support to do so. Gary also felt that many people with disabilities, who had never surfed before, should have an opportunity to try out the sport he is so passionate about. As a result Gary, and his supporters, started DSAA to allow people to surf under the supervision of trained volunteers. Over many years people with all classes of disability and conditions, including amputees and children with limb difference, have been able to enjoy surfing. Indeed, some amputees are volunteers within DSAA, and this article includes feedback from amputee volunteers and participants. The DSAA has set an international best practice model for disabled surfers. The DSAA have 14 branches across most states in Australia, and have even branched out into New Zealand. The DSAA have hundreds of volunteers who are trained to work with people with disability both in and out of the water. Each event includes Beach Marshalls who oversee the event, Team Leaders who coordinate groups of participants and volunteers in the water, and other volunteers who coordinate participant sign-ins and post-event BBQs and get togethers. Volunteers supporting people in the water undertake ‘Train the Helper’ and first-aid training so that participants are well supervised and provided with support that accommodates their needs. Participants include people with a variety of disabilities and conditions ranging from joint problems, paraplegia, intellectual and neurological impairments, and limb difference; so volunteers are very competent at supporting people with a variety of needs and abilities. Each branch is run by a volunteer Board of Management which ensures that their branch is well structured, that volunteers are regularly trained and they are providing exciting beach events during the summer time. The DSAA also take out considerable insurance, which is quite costly and very important when it comes to the provision of water activities, to ensure that participants and volunteers are protected. Ian Gay, President of the Gold Coast DSAA branch and passionate surfer, said that “safety and fun are the key priorities of our organisation and we get such a buzz seeing people enjoy their time in the water. Some of our participants have been coming to events for years, while others are just starting out and beginning to learn to love getting out in the water on a surfboard”. In addition, some participants and/or their caregivers also train to become volunteers over time. At the end of each event, some branches give out awards to participants to recognise the achievements gained. Ian said that his branch offer out awards such as ‘Best Surfer’, ‘Best Wave’ and ‘Biggest Smile’, to name but a few. Importantly, the end of an event is a chance for everyone to get together, chat about how much fun they’ve had and meet new friends. “It’s a really supportive and inclusive environment for everyone,” said Ian. Bruce Peel, an amputee and member of the Limbs 4 Life community, is extremely involved in DSAA. Bruce, who is paralysed in one arm and an above-knee amputee, has been involved in the Western Australian DSAA group for 11 years and is also the Vice-President of the National DSAA Board. “The advantage of being an amputee and surfing is that once you are in the water your disability disappears as you are weightless. Being in the water is good for the soul and it’s wonderful to smell the water because you are in it rather than only smelling it from the beach,” highlighted Bruce. Bruce is passionate about children and young people trying out surfing. “We’ve had many young people with limb differences take part across Australia over the years, and I can assure parents that the safety of children is critical to us. Equally important is building confidence in water; so if you attend an event you will hear very loud cheers from volunteers and other participants when children overcome fears,” expressed Bruce. Holly Franklin, an upper-limb amputee and member of the Limbs 4 Life community, began as a participant “surfer” at the Gold Coast DSAA branch in January 2012, but switched to a volunteer role in late 2012. Holly began attending events, saying “I wanted to learn to surf but wasn’t sure if a regular surf school would suit my needs as an amputee”. As an amputee Holly sees DSAA events as extremely beneficial for both children and parents, and said “you gain confidence in your abilities, develop a respect for the ocean, join a community of support and encouragement, and can gain access to the beach without using a prosthesis. It’s also really safe, as each participant has a number of volunteers surrounding them in the water to ensure that nothing, except the odd dunking, will go wrong”. Holly also feels that parents get a chance enjoy watching their children build skills as well as have the opportunity to engage in informal peer support and comradery with other parents. “DSAA focuses on safety and smiles, so parents can relax while their kids can try an activity that they (the parents) might otherwise not be willing or able to do without the support of the DSAA,” said Holly. For more information about DSAA, local branches and dates of upcoming events visit their website at www.disabledsurfers.org. You are also encouraged to contact the local branch if you have any questions or want to RSVP for an event in your area. You can also visit the Limbs 4 Kids website calendar where upcoming DSAA events are also listed. If your child is considering attending an event and wears a prosthesis, because it is a beach activity, it is a good idea to speak with your child’s prosthetist to ask about whether the prosthesis can be worn on the sand and/or in the water. Unfortunately, if sand gets into your child’s prosthesis it may cause damage to the functionality of the components so it is a good idea to check before going to the beach. Your prosthetist may be able to advise of ways of ensuring your child’s prosthesis isn’t damaged or compromised, or recommend an assistive device (such as crutches or a wheelchair) so your child can be transported on the beach. Alternatively ‘water legs’ may be available. Water legs (specifically designed for use in the shower, swimming pool or beach) are completely covered so the effects of the sand and salt water do not have an impact on prostheses, and may be used for surfing or beach based activities. Again, speak to your prosthetist for professional advice. Thanks to DSAA for allowing us to interview members and learn more about the great work this organisation does in the community. Thanks also to Looks Like Me Surf Photography for the great images of DSAA events.